About two years ago, quidditch was going through something of a “tournament format renaissance.” We had just come off of the 2014 Global Games that was played as a full round robin, the crème de la crème of unbiased formatting, and were on our way toward a World Cup (later US Quidditch Cup) that was going to be played as a Swiss-style tournament—guaranteeing top-tier matchups from early Saturday straight through to the Sunday final. Regional championships had experimented with everything from a double-elimination bracket in the West to a best two-out-of-three play-in round for World Cup bids in the Mid-Atlantic to a tertiary qualification bracket in the Northeast. Whether you liked any one of these formats—Swiss obviously has a cult following and some very strong opposition—you can’t deny the value in them. Each format was built around the individualized needs of a tournament and attending team list at a singular point in time and was tasked with helping that tournament achieve its unique goal—whether those goals were increasing the number of competitive games on the sport’s biggest stage, improving the accuracy of the teams that would receive bids to the national championship or just eliminating any unfair advantages. Just as a well-tailored suit will always be a better fit than one off the rack at Men’s Warehouse, tournament formats will always benefit from this personalized touch. Unfortunately, the renaissance has become more of a dark ages in recent years, and we as a community have become utterly complacent in our tournament formats. From standardized regional championship formats during the 2015-16 USQ season that led to horribly unbalanced qualification brackets—the Northeast’s iteration still brings on chill—to the return to the previous US Quidditch Cup format, the innovation we had seen previously was gone. However, the straw that broke the camel’s back was the choice by the IQA World Cup Gameplay Department to use, once again, the standard balanced pool play to bracket play format—instantly robbing the tournament of much of its watchability, much of its worth to the competing teams, much of its teachable moments and much of its intrigue. So where did we go wrong? Can we turn things around? Should we? I believe we can and should, especially on a few particular axes. Everyone invests a lot of effort into any single quidditch match: There’s travel costs ranging from car trips to international flights, volunteer commitments, time taken off work, classes missed and fields reserved. An official quidditch match is so valuable that a team plays only about 30 over the course of the eight-month USQ season, averaging out to less than four a month. Everything we do in tournament formatting should aim to extract every last drop of value from those 30 games. Any time we put two teams on a pitch with a 150-point margin of victory all but guaranteed, we are failing in this regard. Occasionally, you’ll hear someone argue that there can be value in such blowout matches. But in my opinion, there’s no real reason to think that is the true. The favored team rarely gets out of second gear and often reverts to bad habits instead of improving, while the underdog team is more likely to be discouraged by the result, rather than learn something tangible. The value of increased interregional or intercontinental play is often touted as a strong argument for these matches’ continued existence. However, when the gap in talent level is basically the size of the Grand Canyon, no one is witnessing any interesting clashes of styles—they’re simply seeing two half-checked out teams going through the motions in front of either an uninterested or a non-existent crowd. This singular point is my biggest issue with the pool play to bracket play formats that have become standard in our sport over the past year. Contrary to popular belief, I do actually think there is merit in the format, as suggesting it be used for World Cup V was my first-ever action as a USQ (then IQA) staffer. At a time when the talent gaps were unclear, slight and unquantifiable, the interregional play people sought was rare, and 60 plus teams had to be narrowed down to one winner in a single weekend, it was the perfect format for the job. In fact, with the US Quidditch Cup field shrinking this past season, you could argue it still is—though I’d counter that a lot of the day one intrigue at US Quidditch Cup 9 came from poor seeding, not good formatting. There were 38 games played over the course of two days, and only five ended in snitch range, including just three of the 34 games before the semifinals. That means that not only were more than 85 percent of games on the weekend out of range—a truly striking number—but entering the semifinals, less than one in 10 games had a suspenseful finish. This is purely the result of negligent tournament format planning. If you find yourself in a similar situation as a tournament director and are considering taking the easy route, I beg you to reconsider. The fewer 300*-10 results we have to sit through, the better off everyone—players, fans and volunteers—will be. I know this sounds counterintuitive in an article about tournament formats, but hear me out. Certain events absolutely need to be a tournament with a decisive winner: regional championships, nationals and World Cup. Those titles have always mattered, still matter and will continue to matter going forward. Those are the only tournament titles in quidditch that have been extensively documented. But for the rest of the tournaments out there—the so-called “regular-season” tournaments—they are often worse off being classic tournaments. It is becoming more and more common for “tournaments” to actually just be a meeting of teams, where either everyone plays everyone or each team plays a specific set of the teams in attendance and no one is specifically declared the winner. 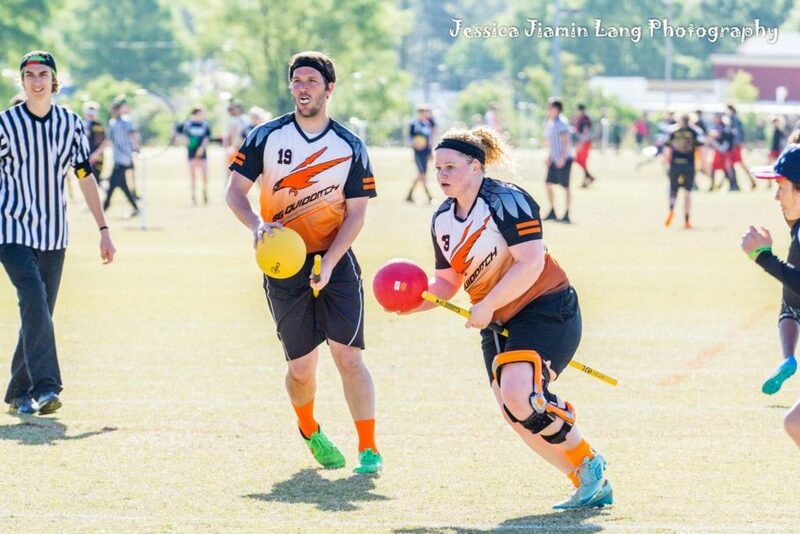 Bat City and Cat City are two great examples of such round-robin meets in the US this past season, with the former being arguably the biggest event of the year before US Quidditch Cup. Conference meets, like those in the Big Apple Quidditch Conference, are a great example of set schedules that aren’t full round robins and also have strong track records of team growth and development. If you are insistent on a larger number of teams attending your event—be it to make traveling to your event more valuable or to increase the amount of money you receive to cover the cost of the event—consider not running a single tournament, but multiple. For example, in chess, there is a common tournament format known as quads, where the registration is open to anyone. Once signups are completed, competitors are divided up into mini, four-team tournaments by rankings, with the top four ranked players in attendance put in their own tournament, then the next four and so on. This way, no matter how much talent variance there is in the signup process, everyone in attendance is on a level playing field within their own four-person tournaments. While quads might offer too few games for quidditch, quints could have some success in our sport. Take, for example, an average 15-team tournament in the Great Lakes, with three Top-20 teams at full strength—Ball State University, the University of Michigan and Bowling Green State University—along with 12 teams from the lower tiers. Out of habit, the tournament director plans a three-pool format, which then moves to bracket play. What this format instantly does, by default, is almost guarantee that the best three teams won’t all get to play each other in this tournament, but will see plenty of games against teams that are nowhere near them in talent. As we have established in our first point earlier in this article, this result is not healthy from a developmental perspective for either the favorites or the underdogs. Instead, let’s say the tournament director utilized a chess-esque quints format. Now, each of the top three teams will play the other two, as well as the next two best teams at the tournament. Meanwhile, young, developing teams can avoid discouraging annihilations at the hand’s of the sport’s best, and can instead compete in games against teams closer to their level. This is, in my opinion, a win-win for all involved. One of the biggest complaints I hear about many tournament formats is that they aren’t fair. A Swiss format isn’t fair because it can create a gauntlet like the one the Los Angeles Gambits faced at World Cup 8. A tiered pool system, like the one that was used in the Olympic women’s hockey tournament, is unfair because it punishes the good teams for being good. Meanwhile, the pool play to bracket play format is touted as the epitome of fairness—rewarding the good teams, spreading them out and balancing the paths to the finals. But fairness is more complicated than that. All tournament formats can be optimized to be as “fair” as possible. But their “fairness” will always favor someone. For every gauntlet run in Swiss, there’s a Pool of Death in pool play. 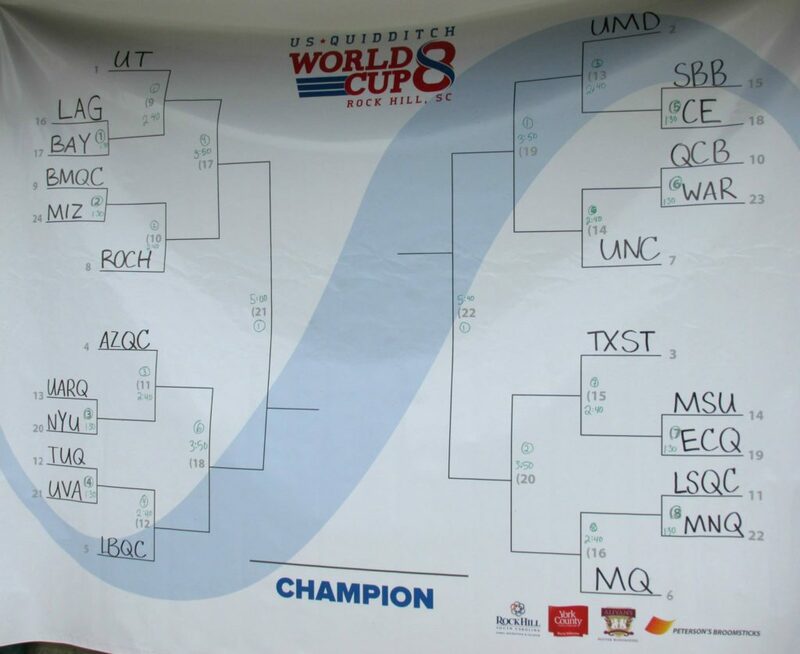 For every Arizona Quidditch Club’s World Cup 8 joke of a schedule in Swiss, there’s the University of Texas’ joke of a pool in World Cup VII and US Quidditch Cup 9. And while Swiss undoubtedly favors teams that are deeper, pool play favors those that aren’t. I can say with confidence that Quidditch Club Boston would not have won US Quidditch Cup 9 if it had been a Swiss-style tournament: Our semifinal against Lone Star Quidditch Club would have looked a lot more like the Lost Boys semifinal against Texas at World Cup 8. So why can’t we see that there are pros and cons to any format? Why are we insistent on always using the pool play to bracket play format? Because the human mind is conditioned to resist change. Pool play is familiar and its faults are familiar. We consider pools of death and pools of life endearing because we’re used to them—but we pick through every issue with a new format with a fine-toothed comb. If we could just put that resistance aside, we can see that a degree of fairness can be established in any format. An unbalanced pool system can be made more fair by paying bigger dividends to the pools with more talented teams. A Swiss system can use a strength of schedule tiebreaker. As long as we are willing to buy in, there’s no limit to what we can try. This brings me to my last point. If you take some time to just look up major tournaments in different sports, you’ll be astounded by the variety and unique formats you come across. Many rugby tournaments are partial to a Repechage format, wherein the best of the eliminated get a chance to play back into the main tournament. Bowling brackets favor a ladder, in which No. 5 plays No. 4 for the chance to play No. 3, for the chance to play No. 2, for the chance to play No. 1. As much as I am a proponent of taking tournaments out of the regular season, I’m realistic enough to realize it’s not going to happen overnight—but I think we can accomplish so much more if we at least try something new. Not only might you hit on something that becomes the exact format our sport needs, but you also could attract more teams to your tournament with an innovative format. So do a Wikipedia dive, find something novel and run with it. At the very least, we might be able to avoid another abysmally chosen World Cup format in two years.